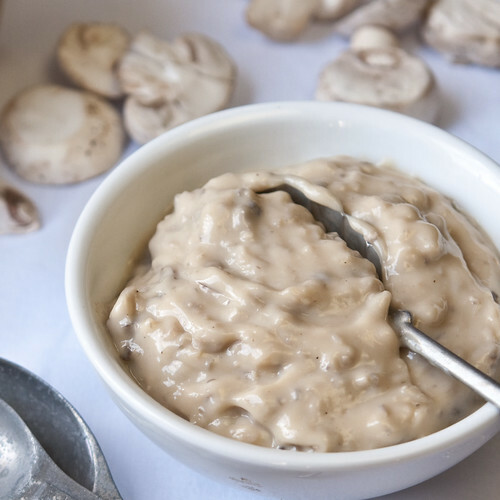 Using only a blender and a microwave, you can make your own Condensed Cream of Mushroom Soup in less than 5 minutes. This recipe is easy to customize to your needs and tastes. Bonus: it’s gluten-free. The reputation of Condensed Cream of Mushroom soup seems tarnished as of late. Some think it’s unhealthy. Others think it’s old-fashioned. Personally, I have a few favorite recipes that call for it so I’m not quite ready to say good-bye. With that in mind, I’ve dressed it up in all its simple, mushroom-y glory for your reconsideration. Would knowing exactly what ingredients are in your soup ease your mind? Make it yourself and you’ll know. Thankfully, condensed cream of mushroom soup doesn’t have to come out of a can and it doesn’t have to take a lot of time. You only need a blender (or food processor) and a microwave to make this recipe in less than 5 minutes. Who has time to make it yourself when it’s so easy to buy? Condensed soups may fit in the same category as making your own yogurt for some people–too much trouble when the stuff you get at the grocery store is good enough and fairly cheap. However, I like to know I can make it myself when I want to. I guarantee if you print this recipe and store in a safe place, some day you’ll be glad you did. Using a blender ensures your soup will be lump-free. Using a microwave ensures the process will be fast and scorch-free. Customize and intensify flavor with crushed or flavored garlic. Do the same with bouillon (cubes, powder or concentrate). Did you know 2% evaporated milk and fat-free evaporated milk contain the exact same calories? Check it out. Might as well use 2% or even regular evaporated milk if you want maximum flavor. Use a blender or immersion blender for extra smoothness. Pulse the blender an extra time if you don’t want to recognize the mushroom pieces; less time if you want bigger chunks. Why cornstarch instead of flour? I prefer cornstarch over flour–better texture, not pasty. More like what we’re familiar with from the red can. Can I use canned mushrooms instead? Absolutely. Well-drained canned mushrooms can be substituted for fresh. What about a sub for onion powder? Replace the onion powder with fresh or frozen onions if desired but they will still be a little crunchy because of the short cooking time. Will one recipe substitute for 1 can? Yes. This recipe yields approximately 10 ounces- the same amount as a “store-bought” can called for in most recipes. Looking for a quick supper idea? Add milk, broth or water for a quick soup you can serve for supper. Put all ingredients except the mushrooms in a blender or food processor and pulse until smooth. Add mushrooms and pulse 2-3 times until mushrooms are chopped. Pour into a 2-quart Pyrex bowl and microwave on HIGH for 3 minutes, whisking well after two minutes and again at the end of cooking time. If not thick enough, add 30 seconds and whisk again. 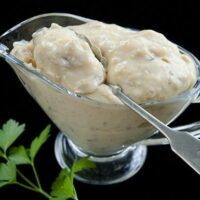 Posts Related to "Make Your Own Condensed Cream of Mushroom Soup in Less than 5 Minutes"
Using only a whisk and a microwave, you can make your own condensed cream of celery soup. Customize to your own taste. Homemade Condensed Cream of Chicken Soup can substitute for the commercial soup sold in the red can. This allows you to customize for your own taste and dietary needs. Gluten-free. 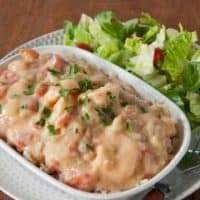 This creamy, spicy, tomato-y mixture with shrimp makes a great company dish when served over rice. 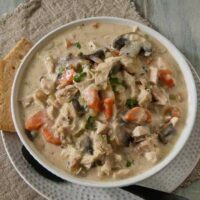 Try serving this hearty chicken chowder over a scoop of mashed potatoes or mashed cauliflower. Also good with cornbread or dinner rolls. This recipe is just what I needed for my cooking classes with seniors who are watching their sodium content. Easily made as vegan too. Just used unsweetened almond milk and added 1 Tbsp of yeast flakes. Quick, easy and healthy. Thanks. You are a lifesaver! My husband had heart surgery a couple weeks ago and is on a low-sodium diet. So many of our favorite recipes call for cream of mushroom soup, and now that I have to read labels, I realize the canned stuff I usually buy is loaded with sodium. I was about to cry because I really hate to cook and I’m running out of edible dinner options. This is so easy, and I can’t wait to try it! I’ve made this twice now, and I have to thank you for this marvelous recipe! I use whole milk instead of canned as I prefer the flavor. I always keep some canned mushrooms in the pantry now just for this recipe, and since I also make my own onion soup mix, I can combine the two for a gravy that my hubby loves, and make it healthier, too, without all the salt. Thanks for the great recipe. We have recently gone gluten free and the stupid canned stuff has modified food starch so we cannot use it. It is great to be able to make the pot roast we are used to but so much better. I just made this recipe and am very impressed! I have always loved Cr. of Mush soup over the years it has become salty and expensive. This recipe tastes like the original Campbell’s recipe. I tried microwaving but found cooking it on med heat in a heavy bottom pot worked best. Thank you for posting this recipe! My 20-month old had to have a kidney removed, and I am always searching for ways to reduce sodium in her diet. 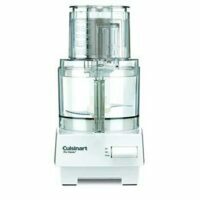 This will help me customized all the recipes our family loves, without using the traditional, high-sodium canned condensed soup. I am excited to try it! I am tired of paying $1.30 for a can of condensed soup, so I thought I’d try this. I sautéed the mushrooms, and am dehydrating them. I will add nonfat dry milk, and make it so that this soup can be stored for long periods without freezing- just put all ingredients dry into a canning jar, then mix together when I need the soup. Can’t wait to taste it! Your recipe is confusing since you call it ‘Condensed’ when the recipe calls for ‘Evaporated’ two different types of canned milks. It would also help if this was in Metric too. I went back and looked at the recipe and it was right to begin with. The recipe is for condensed soup. It calls for evaporated milk. Two different things. But do not use sweetened condensed milk to make condensed soup. It would be extremely sweet and that’s not what we’re going for. Hope that clears the confusion a bit. p.s. to RG: Thanks for the link on metric conversion, too. I have had several inquiries about using soy milk. Thanks for the testimony. Another reason: your son is allergic to soy and cream of chemical canned soups have soy protein concentrate… Yuck! I’ve been making my own cream of mushroom for about ten years now, would never go back to the canned slime even if he could tolerate soy. Just made this. It’s wonderful! It’s a bonus that it’s gluten free too! Thanks. Is condensed tomato soup on your list of things to try? I’ve made this many times and it’s always very good. I will double the recipe and use it in green bean casserole. (And as Thanksgiving is coming up, i’m getting excited to make it!) I will make this soup the day before and after being refrigerated it has the perfect consistency. Also, I will make my own evaporated milk..no canned stuff here…It always comes out creamy and delicious. Thanks for the recipe. this is fantastic! a splash of cooking sherry at the end really livens up the flavor if using it as a gravy or soup. I’ve made this recipe twice and it’s wonderful. Super easy. I make this to replace canned cream of mushroom soup when making gluten free tuna casserole. My husband loves it. Glad to hear it Carol. Tuna casserole brings back a lot of memories. Think I will put it on the menu this week. My husband has to limit his salt intake. Do you have more recipes for low sodium foods? I can’t wait to try to low sodium cream of mushroom soup. Even the low sodium soups in the stores are astronomically high in salt. This could be a life saver!! Annie, I haven’t spent much time thinking about low sodium foods. However, you also might be interested in my Condensed Cream of Celery Soup. I’m currently working on Condensed Cream of Chicken Soup so you can be watching for that. Thanks for posting this. I have been trying to do as much organic and fresh as I can and this is one more to add to the list. I saw where you can freeze it but was wondering if you can can it. Freezer space is at a premium at my house. Do you have a fast recipe for condensed cream of chicken soup? Would you just leave out the mushrooms? 2 of your reason have hit right at home why I wanted this recipe! 1, I’m outside the USA and want cream of mushroom soup! and 2, I want the green bean casserole that I remember at holiday times for this Christmas!! You need to add another to your list though, it’s gluten free! I can find canned mushroom soup, not exactly the same as the USA but it’s all with gluten or warnings of. Just used this for a scalloped potato recipe that called for cream of mushroom soup, and it’s a winner! Thank you so much for having such a simple convenient recipe. Glad to hear it Shannon. Thanks. 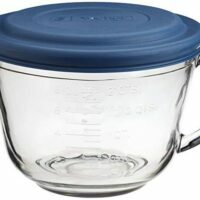 Do I need to microwave the soup if I’m putting it into a crockpot? I’m cooking for a gluten-free Christmas in July dinner, and needed a substitute for the Cream of Mushroom soup in the Green Bean Casserole. This is perfect! I read your tip about the 2% Evaporated Milk having the same calories as fat free, so I went with that. I’m glad I did because I forgot to add the vegetable oil! It seems to have turned out fine – probably because there is some milk fat in the milk. I may never buy canned condensed soup again. This is great with the use of cornstarch! My guy has Celiac Disease and therefore I can’t used canned soups in the casserole recipes I have. Now I can still make my favourite recipes and make this soup and have it in the freezer for whenever I need it. I also wanted to tell you that I make your home made greek yogurt on a weekly basis (or more). I have it every day, and so does my dog (she needs the extra calcium due to a health problem). It’s easy to do and tastes so much better than the store bought. I could never eat the store bought plain yogurt, but this I can. For those people that say it’s easier or cheaper to buy the commercial products, do you really want all those extra chemicals, preservatives and ingredients that you can’t pronounce in your food when you can make your own healthy version at home with just a little more effort than going to the grocery store and plucking a can etc off the shelf?? thanks a lot for this recipe. I live in Norway and I can hardly find the canned version. Reading the post about cornstarch: I recently tried clear jell after reading about it’s benefits when making pies. It apparently has been used in the food industry for some time. It is cornstarch that can be frozen so frozen fruit pies are stable. This might be better if you are planning to freeze the soup for later use. I love the mushroom and the celery soup from your site. My husband is intolerant of corn, it gives him migraines. Do you have an idea of the ratio of potato starch or flour I could use instead? I made this up using 1% milk and it works perfectly and it is much tastier then the stuff in the can! Thank you! me again, sorry Paula, I hadn’t realize you have alredy addressed this question! Paula, do you think I could make this with almond milk as I am lactose intolerant? Just tried this tonight and was pretty pleased with the results. The only thing I would change is to omit the sugar,however maybe my pinch was a bit big. Will definately use again,beats the heck out of the canned version. I was recently diagnosed with Celiac’s disease. I have tried ALL SORTS of recipes to take the place of store bought condensed cream of mushroom soup. I had given up until I found this post. Thank you so much — it’s easy, delicious, and gluten free! Glad you like it. I was motivated to find a better way because I felt the same way about a lot of the recipes I tried. I work at a wellness center with access to a kitchen and we actually don’t have a microwave. How long would you have to cook it on the stovetop and at what heat, high, low, medium? Oops, just saw the same question above from January 28th. I’ll try it on the stovetop till it thickens and see how it goes. Thank you. My son is allergic to dairy and soy. Cream of anything is out of the question, which has taken MANY things out of my cooking repertoire. I love this recipe, but I’m not sure what to sub for the evaporated milk. My son drinks rice milk. Do you think it will be thick enough to sub for the evaporated milk? Should I change anything else to help make up for the thinner consistency? To my knowledge, there is no rice milk evaporated milk out there. Can I make that?????? So sorry that I did not see the post from earlier today before sending. recipe. Especially for slow cooker recipes. I really can’t tell you how long to cook on a stove top. It will vary with the kind of stove you have and the pan you are using. Just cook it until it is thick like gravy. Substitute the same amount of rice or almond milk for the evaporated milk. HOWEVER, I can make no guarantees for how well it will do in the slow cooker with the substitutes. The reason I use evaporated milk is because it is more stable when the recipe needs to be cooked/baked for a long time. You could but don’t have too. It’s an extra step that I’m sure would enhance the flavor. Thanks for asking. Has anyone run the costs and decided if this is cheaper than buying the canned stuff, Campbell’s or store brand? Thanks for the tip Gail. I prefer making recipes entirely from scratch and ran across this recipe by accident. I quadrupled the recipe and didn’t have any problems. The only change needed was the microwave time, I used 5 minute increments with a lot of stirring in-between for maybe 15 minutes total. Turned out very very nice. This is going into a green bean casserole today (Thanksgiving). Thanks so much for this! I definitely prefer the flavor to the canned variety. Thank you for the recipe. I use to cook with Campbell soups quite a bit. But they use potato starch and my DH is deathly allergic. Love the versatility of being able to bring it back into my reportoire. If you have any further suggestions on how to make it both diary free, almond free and how to do it on the stove. I would appreciate it. Do we have to use onion powder? Good question Carly. No, you do not. You can use fresh or frozen, chopped onions, maybe 1-2 tablespoons if you prefer. Or, leave the onions out completely. The onion powder gives a taste closest to the commercial condensed cream of mushroom soup but using real onions results in a fresher taste. Thank you for the quick reply Paula. I am planning on making this recipe soon! Hope you like it and find it easy enough. Also check out my Condensed Cream of Celery Soup. Thank you Google and Paula! Last night I made a gravy using cream of mushroom soup and it was so salty! So I came on looking for things to substitute it! Thank you for posting. I can’t wait to try this! I could give you a big hug and kiss I’m so grateful to have found this! Thank you so much. We don’t buy canned soups due to the high sodium content, which makes your recipe very welcome. I’m going to make lots and lots of this and freeze it and/or can it in jars myself. Thank you for creating a recipe my whole family can appreciate! Pinned it and am posting to my healthy cooking page on FB now!! Seriously the best recipe! Thank you! Thank you for a great recipe. I love cream of mushroom soup but can’t eat commercial brands because they all use MSG. Now I can enjoy one of my comfort foods again. I have been looking for a recipe like this. I have acid reflux and canned soups make me sick so I want to make my own. The problem is I am trying to eliminate all canned products because of the acid in them, I am wondering what I can substitute for the evaporated milk. Any suggestions? Thank you. You ask a VERY good question. I use evaporated milk in the recipe for two recipes. First, it gives a taste closer to what we are used to in the commercially canned product. A second, even better reason would be that evaporated milk stands up better to heat. So if you are using this soup in a casserole as many of us do, you want it to be able to withstand the additional baking most casseroles require. Also, the evaporated milk product freezes better, too. For the freshest and best taste, you could use half and half or really, any kind of milk or cream as a substitute but it will surely separate if it boils or bubbles too much (more so the less fat it contains) in the original cooking process or later, when added to other ingredients. Just realize it is much more delicate than evaporated milk. I just tried this. I quadrupled all of the ingredients with the intent to freeze some.mi also replaced 8 oz condensed milk with half & half (I didnt have enough). Mine is very watery. I am still heating it over and over and over in the hopes it will thicken. I also added 2 extra teaspoons cornstarch. I’m working on a cream of celery soup. Hope to share soon. I managed to make this vegan, and wanted to let other vegans know how – take 8 oz. of non-dairy milk (I use almond, but soy works well. Rice might work, but I’m not sure. It’s kind of a thin milk so best not to chance it). Mix the non-dairy milk with powdered soymilk – use TWICE the amount the label recommends using to make one 8 oz. serving. That’s it! Haven’t tried this myself but sounds like it would work. Thanks so much for taking the time to write it out. Paula – I forgot to mention that was to sub for the condensed milk. 😉 I’m sure most will figure that out, but just in case. Your recipe is just what I’ve been looking for, thank you so much for sharing. I do have a question though. I have a few recipes that call for a can of condensed soup plus equal amounts of water or milk. Does you recipe work the same as the can, or do I use the recipe as is? Use it the same as you would the commercial can. Add water or whatever liquid just as specified. Hope you enjoy. 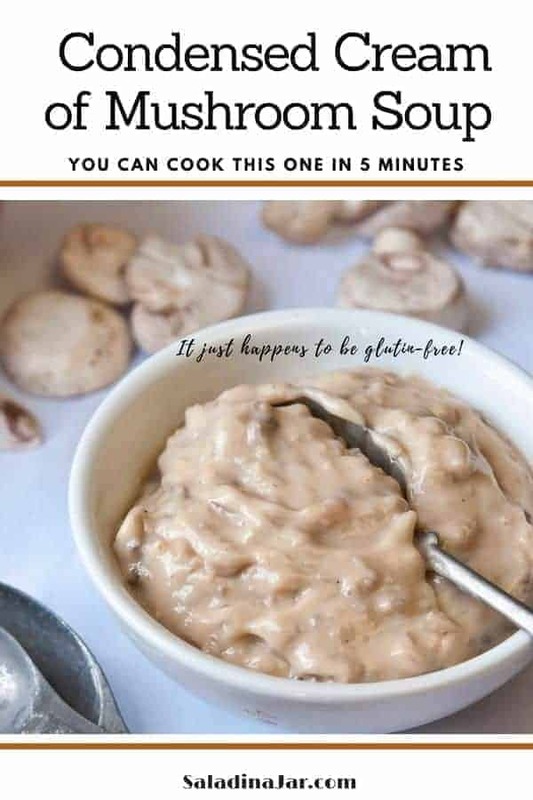 Paula – this recipe is awesome for all of us gluten free folks! It seems like it would be easy to also do a cream of celery and cream of chicken version of this – have you experimented with that? I wouldn’t have the first clue how to do it, but if you figure it out, please post it! Thanks!! Funny you should ask. 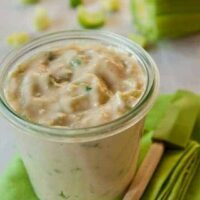 I’m currently working on cream of celery soup and hope to post about it before the end of the summer along with some ideas about storing celery. Thanks for stopping by. Would you be able to can this in a water bath or pressure cooker? I have neither tried it nor am I an expert on home canning. I’m sorry I really don’t know. Personally, I freeze it. Works great. I just made a double batch and wow, so good! I don’t use anything but butter, evoo, and coconut oil so I subbed evoo for the canola oil. I pureed the whole thing real good in the blender, then added two huge portabella caps minced fine. I cooked on stove top low and slow (after getting it to a good simmer) and it thickened up beautifully. It is SO tasty my hubby and I were licking it off the spoon! I also added about 1/2 tsp garlic powder. I am freezing these in 2 cup measurements, equal to about 1 can. Thanks for a GREAT recipe! I stumbled upon this recipe today and I’m super impressed with how it came out. Husband said that I’m not allowed to buy the canned version ever again! I started with dry milk powder, added water and warmed it on the stove. It comes together in less than 5 minutes so make sure your mushrooms are chopped before you start. I used white truffle oil and mushroom infused olive oil and holy cow- a mushroom lover’s dream!!! Thanks for the recipe- this is a definite keeper! Truffle oil? WOW!!! and mushroom-infused oil? Never heard of it but I will be looking for it now. don’t have a lot of freezer space. can i can this? This is absolutely marvelous! I switched it up a little bit to my liking. When I used to eat canned condensed soup, I always like to mix the mushroom and celery together. So, I sauteed 1 half an onion and 1 stick of celery in a tablespoon of natural, unsalted butter, untill soft. I added that to my food processor and blended it till smooth, then I added my fresh onion. It turned out to be so flavorful! I can’t get my husband to touch any cream of “?” Lol. He loved this though, so thank you! So glad your husband liked it. I can see you’ve figured out how to modify it to your own tastes. Fantastic! Another reason to make your own: Someone in your house has a gluten allergy. I can’t wait to use this recipe! I can grab some gluten free noodles and make tuna casserole again!!! 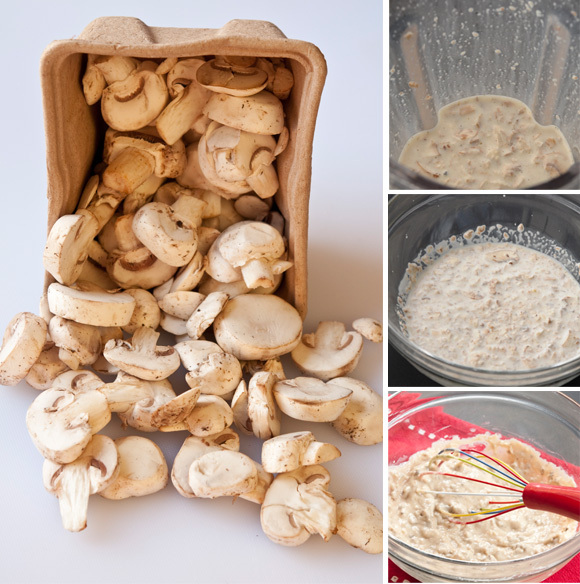 Can you use dehydrated mushrooms? And is there a certain type of mushroom that tastes better or is recommended? I order them from Olive Nation in bulk because I feel its a better deal because they don’t go bad, as they stay good for a year when they are dehydrated and always great to have on hand. One of my favorite go-to casseroled requires condensed mushroom soup and because I recently had to become gluten free, I had been missing it. This turned out really, really well. It has more flavor than canned soup. Thank you a million times over! You’re welcome Sara. Glad you liked it. Found this because I need to substitute dairy for rice or almond milk and want to eat skillet pork chops with mushroom gravy badly! Looks wonderful and easy! Thanks! Dana, I’ve never used rice milk but the almond works great. You can also add to your list: if you want it Gluten FREE!!! thank you!!! Can I “CAN” this soup of do i need to freeze it? Did a quick google search and came across your recipe. I definitely want to try it sometime! I might try making my own evap. milk as well, using this recipe http://www.cookonashoestring.com/2010/11/05/diy-evaporated-milk/ If I’m going to not use canned products, I might as well go all the way! Nice post. Some parts are hard to understand for me, non-native english though… Do you know any good translate plugin for WordPress? I cooked it on the stove (I’m against microwaves if I can help it). It didn’t take very long at all! Maybe 10 minutes? I put the heat on high until it got hot, then reduced it to medium and stirred until it was the thickness I wanted. Great recipe! I’m excited I found it!! I’m sooo sick of all the crappy MSG in canned soups. We have eliminated them from our house. This recipe was super easy too! Thanks! 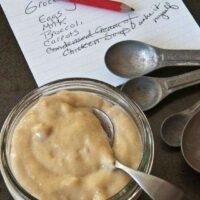 We don’t eat MSG either, haven’t for years- and I have been looking for a way to replace cream of mushroom soup in recipes. Usually I’ll just skip over a recipe that calls for it. There’s a great chicken recipe I used to make with campbell’s soup years ago (before I got smart 😉 and now I can make it again! Glad you can enjoy your chicken recipe again. Thanks for writing back. This is awesome! 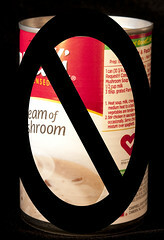 I love mushroom soup and avoid all canned goods due to the BPA content. Being able to make this from ingredients I can say and spell (and often have on hand) is wonderful! I’ll be trying it this week. Thanks for the great recipe! You can make this using chicken stock or beef stock instead of the milk. This looks great Paula! What could you substitute for evaporated milk? We can’t get it here. I steer clear of recipes that call for evap. milk because of that but this looks too good to pass up. Any suggestions? Fantastic! I had no idea that 2% and skim evaporated milk have the same calories! I wonder why? Doesn’t make sense to me. My husband’s ‘system’ doesn’t react very well to the usual canned condensed cream of mushroom soups. There goes some favorite hotdish recipes to the graveyard. But I’ve finally put two and two together that I can make my own version of that ingredient and control what goes in it. Though other condensed cream of mushroom recipes are long and tedious, yours is not. Hallelujah! Pass the tator tot hotdish and greenbean casserole! This is great! I was grocery shopping yesterday and my original intention was to buy more cream soup, enough to go ahead and fill up the slot for cream soup in my cansolidator (fancy shelf for holding cans). But… because I have been reading so much about msg, and I even remember learning about it in a brain and behavior class I took in college. It is a neuro toxin. I finally couldn’t overlook that fact any longer and I left the soup on the shelf. I am so excited to have a recipe now because cream soup is such an easy thing to have on hand when whipping up a casserole. Yay! I will just find something else to fill in the space on my cansolidator. Paula, I am very anxious to try this — however, I am just setting up housekeeping after having to get rid of everything in a recent move. So I don’t have a blender. I do have a microwave. 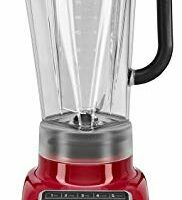 Any suggestions on how to do without the blender? I do have a hand mixer. I thought I could hand mix and chop my mushrooms really fine. A whisk with some real elbow grease behind it is a pretty good substitute for a blender. It may take me sometime to get the hang of making homemade mushroom soup since I just started cooking. You can do it Linda. It’s not hard at all. Let me know if you have any difficulty. I never had homemade mushroom soup before and boy have I been missing out on a good soup! This soup is absolutely delicious and so fast and easy to make. Thank you! I just found this, and am sooooo happy I can’t tell you. Only question…how long would I have to cook this over the stove????? We do not own a microwave and don’t plan on ever owning one again? Our daughter can not have any “processed” foods, and this is her favorite soup. Thank you, thank you, thank you! I found out a couple of years ago that I cannot tolerate MSG. Since then I’ve had to forgo many of my favorite recipes. Now, I can have them again. Making a pot roast tomorrow with cream of mushroom soup. Can’t wait. The stuff in a can has MSG in it, which is NASTY!!! Thank you for a safe home made version!!!! I just made this and it turned out really well, and was so easy! I was making a chicken casserole and it called for cream of mushroom, but I am tyring to get away from buying store bought things, that are in a can or box of course, and this was perfect. My casserole tastes wonderful. Thanks alot for this simple, wonderful recipe. I would love to try this but because I am allergic to Milk, I get hives if I touch or eat it. Can this be made with milk substitutes such as Flaxmilk, Silk Soy for the evaporated milk? Just wondering if anyone had try substituting. I am so excited to find this. I cannot have MSG so I am happy to be able to make my families favorite recipies again with out using the canned kind of mushroom soup. I doubled the recipe because I needed two cans for my recipe. I did have to micro it quite a bit longer. I also added 1/4 tsp more cornstarch mixed in just a bit of cold water to bring it up to the consistency as shown. Tasted yummy in the Pork Chops in a Crockpot recipe I made. Thanks for the great recipe. I feel better about serving this to my family. Angie, using the microwave becomes less efficient as you make larger amounts. Still easier in my book. Glad it worked out for you. Can you use olive oil instead? What about Greek yogurt in place of 2% evaporated milk? Regular or fat free? I came across your site from blog roll at Cook The Story. Thanks for developing and posting this handy recipe! I have a handful of Very Expensive shiitakes that are slooowly aging in my fridge. They are too precious to throw out but are, ahem, past their prime. Perfect for condensed cream of mushroom soup! I love that I can control the sodium content as well! You are awesome.. I can’t wait to try this..
OMG! I love that I now have a recipe for HOMEMADE mushroom soup. I have a few recipes that call for it, but I steer away from them because I hate the can stuff. This is the best solution and one my favorite DIY! You should totally submit this to LifeHacker.com. They have a food section! 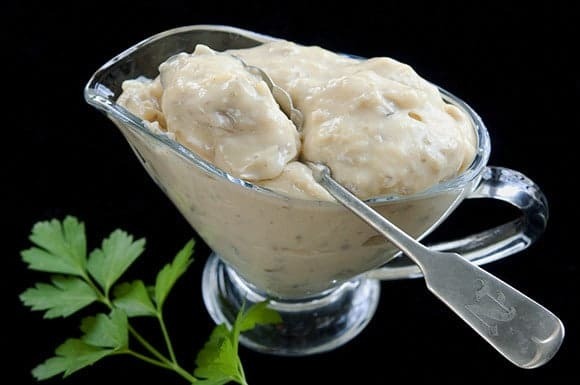 Great idea making your own condensed cream of mushroom soup. I avoid using the store bought ones because of the fillers, sugars and salt content, so this is a nice option. This is such a handy recipe to have, and it looks so quick and easy to make! I love the fact that I can make it with as little salt as I want. Canned soups are so high in sodium! Cream of mushroom soup is one of my guilty pleasures…just like reading my moms old betty crocker cookbook and sometimes making a whole greenbean casserole out of season just cause I want it! Have you tried any other varitions of cream of soup…like asparagus or broccoli? I cant wait to try this! Rachel, I have not tried any variations. But I plan too. The asparagus idea sounds especially good. This looks yummy. Can this be used for Carbonara or pastas? I would probably not use as is–too thick. Remember it is “condensed”. Add some milk or broth to thin it a little and you will have the beginning of a delicious sauce. This is awesome! I am so happy to see a gluten free condensed soup recipe that is SO easy. I will repost this on my gluten free cooking blog right away! 🙂 Thanks! Rosemary, I don’t know much about gluten-free cooking but glad to hear it. Hope it works for you. This is why I am SO excited for this! Campbell’s is NOT gluten-free, so we’ve been using Progresso Creamy Mushroom. It’s not condensed, but it’s usable. 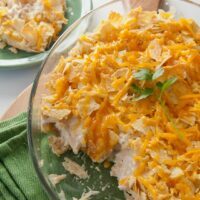 Recently, they’ve changed their recipe or something so my husband (celiac) hates the soup, and we use it in many of our recipes: tuna casserole, chicken and rice, hamburger gravy, etc. I cannot wait to try this. Thank you so much for posting it! I’m in the same boat, with a husband who can’t have gluten. I hate to pay $3+ per box for the gluten-free cream of mushroom soup. Having a recipe to make it fresh is going to be awesome! I’m right in the same boat with the rest of you! My husband (who is full-blown Celiac) and daughter are gluten-intolerant, so I was buying the Pacific Foods organic cream of mushroom, which you can get on sale for around $1.66 at Target grocery, BUT, it is LADEN with sodium! 760 mg!!! :O And as someone who is battling the beginnings of high blood pressure, I a seriously looking to cut back on sodium. Plus all the other krap that is in canned and processed foods. This is amazing, and the fact that you can freeze it means I can do a big batch one day when I have cook time, pop them in the freezer and grab one whenever I need it! Outstanding! There was also a recipe I had years ago that was a dry mix that you just added water to when you wanted a cream soup. It was made with powdered milk, and that was the recipe I was in search of when I stumbled on this. Great! Ok, that is just the weirdest and most wonderful thing…. homemade cream of _______ soup! I have never heard of that… but so true. Now you can freeze it too – just to have on hand – perfect! I’m sure it tastes 100% better than canned….! Do you know if it freezes well? Yes it does. I put one batch into a zippered sandwich bag and gently mash it flat to freeze. Doesn’t take much room that way. This is a great recipe! I’ve always wondered how to make it or if it could even be homemade. Looks delicious! This looks really good- much better than the in the can kind. I’m going to make this…thank you! I never liked the ones in the can because I always think I can taste a slight metallic taste from the can! Thanks!! I have not tried it without cornstarch but if you don’t put enough thickener, it will be more like gravy. But no thickener?? I can’t imagine how it would be usable–at least in the way you would normally use condensed cream of mushroom soup. If you are trying to eat corn-free like me, use arrowroot powder instead. Haven’t tried that Anne, but I will. I always keep arrowroot for my stir-fry sauce so have it in the house already. Thanks for the suggestion. I’ve been using Clear Jel, which is a modified cornstarch and I love it. I make and freeze pot pies and fruit pies, and regular cornstarch becomes runny when I bake them; Clear Jel doesn’t. There are two types; for baking, use the type that thickens with cooking. I have to order mine from Amazon. I will use it for this recipe as I’m very likely to freeze it in batches. Clear Jel? I must investigate. Very interesting….and thanks so much for writing. Thank you for this awesome recipe. I make alot of casseroles that call for mushroom soup and this will make them even better! How cool are you, figuring this out? Homemade is always better–you need to re-post this again at Thanksgiving when everyone’s making green bean casserole! Yep, you’re right. Good idea.